Who brings into their home a kid’s book called ‘Mister Babadook’, crammed with drawings of scary toothy shapes peering around bedroom doors? The answer is left deliciously vague in this slow-building, expertly unnerving horror movie built around a broken Australian family. Amelia (Essie Davis) is a tired-looking carer in a nursing home and grapples with single motherhood in the wake of a car accident that killed her husband while he was driving them to the maternity ward. Samuel (Noah Wiseman), the surviving child, now six, is stuck in his shouty phase, has a hyperactive imagination and is obsessed with weapons. These are precisely the wrong people to be reading dark bedtime stories, yet mysteriously, there’s the book on the shelf. And there goes your peaceful night’s sleep. Actress-turned-debut-feature-director Jennifer Kent has the storytelling balls to show her entire hand in the pop-up story contained in this freaky book and then make us squirm as events come true. Even more impressively, Kent doesn’t shy away from Amelia’s off-putting mental state, an internal battle between motherly love and obvious resentment. Young Sam will always remind her of her dead husband, and ‘The Babadook’ is female-centric in a way that other horror movies rarely are. It’s a tale in which the real terror might have already happened. Parents, brace yourselves. Kent is a natural horror director. She favours crisp compositions and unfussy editing, transforming a banal house into a subtle, shadowy threat. You’re not going to be sprung out of your seat by an overzealous sound designer. By the time the beast shows up (a wild creation of puppetry, stop-motion animation and suggestive noises), it’s possible to be just as riveted by Davis’s mouse-turned-lioness performance, tearing into the register of fellow Aussie Cate Blanchett. If Kent’s goal is to steer horror back toward a rigorous, non-digital realm for serious artists (a welcome trend also seen in last year’s ‘The Conjuring’), her work is done. This movie makes all the top horror lists and I really fail to see why. Currently sitting on the No1 spot as Netflix's scariest movie! Really disappointing as discussed in the reviews below and a totally bizarre ending that offers no conclusion to the story. I found it more a stressful than scary watch. Lots of people raved on about this film but I fail to see why it was so great. I liked the different take on the bogie man type story and dark and moody sets, but the story line was mish mashed and hard to follow. Some really disturbing scenes between the mother and her child to add to the fear factor but not very jumpy and a very confusing ending. Engaging horror drama. Three and a half stars. My honest opinion? A pretentious pile of pure trash. Hard to watch. The Mother was a hysterical wreck and the son was an annoying wreck ball, loud an obnoxious, hard to endure, honestly. The monster was made of cardboard and animated in stop-motion with a very few CGI inserts. All this trash wrapped up neatly into a garbage bag of psychological metaphors with a ribbon on top. Nah, I don't buy it for a second, it's still pure trash. Finally a horror film with no jump scares. When a disturbing storybook called 'The Babadook' turns up at their house, Samuel is convinced that the Babadook is the creature he's been dreaming about. His hallucinations spiral out of control, he becomes more unpredictable and violent. Amelia, genuinely frightened by her son's behaviour, is forced to medicate him. There are so many bad horror films out right now that I'm pretty tired and sick of seeing, but The Babadook is not like those films. This horror movie did something that Annabelle or Ouija couldn't do, and that is try to be original and scary. Babadook is a movie that got under my skin if I got to be honest. The chilling, uneasy atmosphere and it's sense of fear that this movie truly nails it for me and not like most horror films today that lost that sense of fear, and just allows on lazy Jump scars. The acting in this movie was top notch and that I got to say that Essie Davis did excellent in this movie. Even the little kid did good. The other thing that this movie get's right is the fact it says "F'ck jump scares", and tries to scary the viewing auditions and not be throwing loud sounds to make some people jump a little bit, no it goes for the good old fashioned method of a good horror films and that is showing frighting images that will stick in your mind until the movie is over. My only problems with this movie is it's slow at the beginning and the ending to the movie was a bit ridiculous. Overall The Babadook is more than you're cliche monster movie, it focus on doubt's and depression which made the movie even scary, because if you got doubt's and depression running throw your head and meanwhile there might be something out there after you and your kid then it can mess with your mind and cause terror. An interesting one this. One ones side it's a boogeyman movie, on the other it's a drama about a mother trying to live with her dysfunctional kid who can be a little angel one minute and a screaming devil the next! Rather low key, it's certainly not one of the scariest movies ever like the posters say, but it does have its creep moments. I wanted more from this movie though and the ending was just really odd. Cursed or demonically sentient toys have been a mainstay of horror for some time as there is something unshakably creepy about an object as innocuous as a clown doll or Jack In The Box harbouring insidious designs. The ‘haunted’ object in this case is a pop-up book which turns up at the house of widowed mother Amelia (Essie Davis) and her troubled son Samuel (Noah Wiseman) just in time for a bed time story. Inked in muted greys and browns, bound in thick red leather and embossed with the words “Mr Babadook”, the book unfolds like a German Expressionist Cat in the Hat, rhyming its way to a morbidly threatening conclusion. With a flair for DIY Goonies-style weaponry and an overactive imagination, Samuel swears to protect his mother from the book’s monstrous protagonist, but his frightening behaviour soon has him kicked out of school and them ostracised from their family and friends. Alone then, they must face The Babadook. 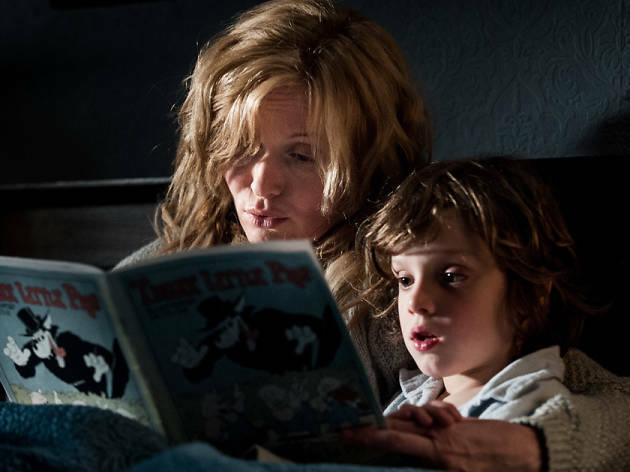 The Babadook pop-upThe last few years of horror have seen children prayed upon by a wealth of boogeymen – not least due to the outstanding successes of films such as Insidious and The Conjuring – and it is a subgenre that is beginning to creak under the weight of its cliches. As most horror cycles tend to do, the formula has become a little stale, evidenced in the less than thrilling sequels Insidious Chapter 2 and Annabelle. On the surface, it looked as though The Babadook may have been lazily falling in line, but first-time Australian writer/director Jennifer Kent has ensured that her debut is a film that burrows a little deeper. With a slim budget (partially crowd funded through Kickstarter) Kent opts for a lo-fi approach, using in-camera effects and fraught performances from her two leads to eke out the terror and a constant, bubbling sense of unease. Moreover, without the pressure that comes from studio funding, the focus leans far closer to psychological and emotional terror than its more overtly crowd-pleasing horror kin. Having lost her husband in a car crash on the way to the hospital to give birth to Samuel, Amelia’s grief literally manifests itself as a haunting, opening up the film to far more satisfying metaphorical readings than simple ‘boo’ scares. As Amelia, Essie Davis gives the sort of performance one might find in early Polanski; distressed by her son’s antisocial behaviour and plagued by insomnia, she gives a masterclass in portraying the gradual unhinging of a mother under pressure. It’s no accident that the peripherals of the drama are populated with reminders of mental decay; between the dementia ward where Amelia works and the Parkinson’s suffering next-door-neighbour the fear of losing control of one’s mind is oppressively present. The Babadook closetWiseman too is uncannily convincing as the seven-year-old Samuel in a role that requires a great deal of heavy lifting if the film is going to achieve the pathos for which it strives. Ranging from cutesy psychotic (“I’ll bash it’s head in!”) to Omen levels of dysfunction, our initial impression is buried in stress. Yet, as the situation unfolds we find ourselves cowering with him beneath the blankets. Echoing Jack and Danny Torrance from The Shining, theirs is a relationship that we are rooting for, but as they both begin to crack beneath the pressure of the haunting the violent tension between them reveals itself as the real threatening force of the film. As for the monster himself, Kent is masterfully sly, keeping him mostly hidden for the majority of the picture. The excellent, vibrant camera work implies his presence and as the film progresses their house begins to resemble the one from the book, shadows slowly engulfing the walls and furniture, and rooms seeming to shift in shape and size. Whilst the film’s brooding first half may prove to be too slow paced for some, the climactic scenes are sure to yank them back in as both mother and son are pushed to the edges of their sanity in battle against the creature, culminating in one fantastic, heart-pounding and beautifully staged scene. Davis’ reading of the line “YOU ARE TRESPASSING IN MY HOUSE!” will send chills down your spine whilst urging you to cheer. With numerous allusions and hat-tips to other films, from Méliès to Kubrick to Tobe Hooper, this is a rare treat that acknowledges the history of the genre whilst trying to bring something a little different to the table. Whilst it may not be quite as revolutionary as you might wish, there is no denying the film’s power to move you, terrify you and haunt you for days and nights after.